In July, a British Council survey found teachers in Wales were "extremely worried" about the future of foreign languages. 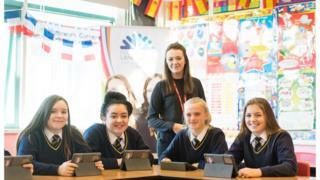 The MFL project is part of the Welsh Government's five-year Global Futures plan to improve and promote modern foreign languages in Wales. Prof Claire Gorrara, from Cardiff University, the academic leading the project, said it had been "very successful" in its first two years. "There's a national average of around 20% uptake of modern languages at GCSE," she said. "In the first year, 57% of pupils who were mentored chose to take MFL in Key Stage 4 and, in the second year, we worked with over 800 pupils across Wales and had an uptake of 50%, so we are more than doubling the national average for Wales." Prof Gorrara said the poor uptake of foreign languages in Wales was down to "structural issues" and a "very strong monolingual mindset". "The way in which timetables and option columns work in schools does disadvantage subjects that aren't core to the literacy and the numeracy framework," she said. "It's also been impacted by broader public indifference to languages - a very strong belief, paradoxically in a bilingual country - that speaking only English will be sufficient to make one's way in the world." The scheme enters its third year this weekend, with a new batch of students from Cardiff, Swansea, Aberystwyth and Bangor universities taking part in a mentor training course. Tallulah Llewellyn Machin, 23, a Cardiff University graduate in French, said she thought pupils found it useful to have someone to talk to who was not a teacher. "I found they were more honest about issues they had and the things they didn't like about language learning," she said. "You definitely come across kids who say 'why bother?' I tried to encourage them to see the positives and all the career opportunities languages can give you."